Of all the things I had anticipated about being a new mama — the sleep deprivation, the fact that sometimes babies cry for no reason, whatsoever, that they look ridiculously cute things that are too big on them — at least one of the things that I hadn’t considered was, well, the Itch. The one you get at the end of your nose nearly the second after you start feeding the baby and have not a finger free to scratch it. It’s not always an itch, though. Sometimes it’s a just a bit of water that you need — just a sip! from that glass just two feet in front of you! Oh, how you would do anything for that sip of water! But a lot of times these days, it’s a recipe. I can’t help it. I have so little time to cook and yet these recipe ideas are getting louder and louder in my head… winter salads and tangy pies and buttery leeks and funky salsas and I have more dishes than I could cook in two hundred nap times, it seems, nonetheless in the 15 minutes of a single one that is left after I have both scratched my nose and taken that sweet, sweet sip of water. So, I keep a list. I jot all of these ideas down and I arrange them according to urgency and to keep myself sane, I only look at the top item at any one time and try to plot my course accordingly. A couple weeks ago, it was a faintly gingerbread-spiced bread pudding with chunks of apples, studded with plumped raisins and on our next trip to the market, I bought some apples and on another trip, Alex bought some raisins and we hit up one of those Ukrainian restaurants in our neighborhood for some of their homemade challah and on another run I remembered to buy some milk and eggs and finally, 9 days and 14 hours and 26 minutes (or so) after I had started dreaming of a fall bread pudding that could be dessert or decadent breakfast or just something to make our apartment smell so ungodly awesome, it even mesmerizes its tiniest inhabitant, I had this one in front of me. And — thank god — it was totally worth the wait. Ironically, the part of this recipe — after the flavor profile, of course — that I was the most curious and excited about was the one that ended up being a flub. The original recipe called for separating eggs, whipping the whites separately and folding them into the custard batter. Alas, the custard batter was far too wet and thin to do anything but allow chunks of white to float to the top, like foam, leaving a sticky and distinctly not meringue-like layer on top of my pudding. My synopsis? Pass on splitting eggs. Finally, as far as bread puddings go, this is not one that is overly eggy or custardy. For some, this is a plus. But if you like your bread puddings truly submerged and then suspended in their custard, rather than just lightly soaked in it, increase the eggs to 4 and the milk to 4 cups. The spices and sugar can remain the same. Preheat the oven to 350°F. 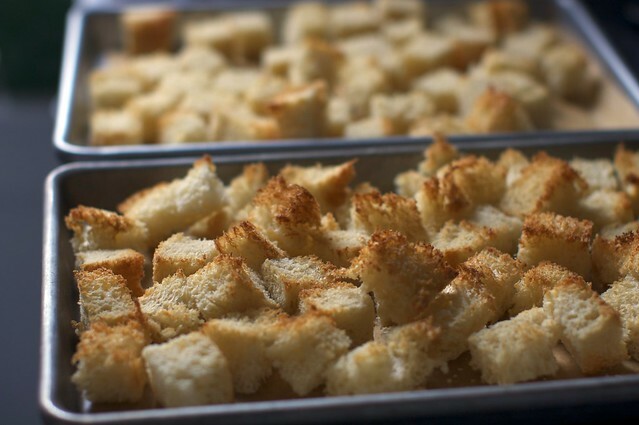 Spread the bread cubes on a baking sheet and toast in the oven for 6 minutes, until crisp. Transfer to a bowl and add the apple and raisins. Generously butter either a 9×13-inch deep baking dish or six 8-ounce ramekins. If using ramekins, set them on the baking sheet. In a medium bowl, using a handheld electric mixer or whisk, beat the eggs with the sugar. Beat in the ground spices, vanilla and salt. Spread bread mixture out in your large baking dish, or distribute it among ramekins. Pour the custard over the bread mixture, nudging the bread around a bit to make sure it soaks all of the pieces. Let stand for 5 minutes. Sprinkle the almonds on top. Bake in the center of the oven for about 40 minutes, until puffed and set, with the tops lightly browned. Let the bread pudding(s) rest for at least 15 minutes before serving. Reminds me of being a kid! Bread pudding is one of those things that can either be done so well or so poorly. This recipe looks DELICIOUS. Going to have to try it. Good luck with “The Itch”! Oh, this bread pudding looks tasty – but thanks for the reminder about that cauliflower and olive salad! YUM. This looks like a perfect bread pudding for the season! I remember having the same thoughts when I was nursing my kids. I ended up setting up a table beside the chair, with all the amenities – water, chapstick, phone, book (in case baby fell asleep)… Having a baby is definitely a learning process! Looks fantastic! And I know what you mean about the itch and the water. My baby boy is 11 weeks and EVERY TIME I sit to feed him I am insanely thirsty. I’m glad there is someone out there going through the same issues as me right now, I’m sneaking in kitchen time when ever I can. And the remembering things at the store? Forget it. That’s so true about the itch! And you know if you move they’ll wake up…. This looks yummy and I’ve never had bread pudding. You need to start exercising your toes! You would be amazed at what the feet can do for you when the hands are occupied with a baby. Maybe not scratch your nose or get a glass of water, but they are great at picking up other items! Oh wow. This looks great. I checked your site yesterday to see if you had posted more recipes with apples. I am writing about heirloom apples and orchards all week on my gardening site. There are so many great recipes out there, but this one is new to me. I will have to give it a try – you have given ME and itch for bread pudding. Timely and fantastic. This looks like the perfect fall treat. Thanks for sticking with us despite the baby busyness. You’re doing a great job! I’ve never been a big bread pudding fan because of the egginess–so maybe this one that is light on the eggs is the one for me! I’ve wanted to make a fall bread pudding but just haven’t found a recipe to entice me. This one looks yummy. I appreciate the insight re: the custard quality. I’m thinking to substitute some dried tart cherries for the raisins, or maybe cranberries. Or use a golden raisin and cranberry combo. Hmmm….so many choices! Huh. Looking at the original recipe it doesn’t really make it explicit, but maybe they expected the egg and milk mixture to be a bit thicker? A little more into custard land and less into I just mixed my milk and eggs land? I always think of custard at least at the starting to thicken stage. Yours, of course, looks delicious and reminds me that I have a loaf of bread waiting for me to make baked apple french toast… it’s like bread pudding only pretends to be healthy! Seanna — I agree, and had expected a thicker custard. If you, or anyone else, try it according to the original recipe’s egg separation suggestion, I would love to hear if it worked out (I had been obsessed with the idea of a fluffier egg pudding) and my flub was just user error. wow I am salivating already! CONGRATS! on the 2009 foodbuzz awards..2 awards for your fabulous blog! you raise the bar to new heights with your writing, photography & recipes! thank you for your creativity & talent! this week’s baking for me is your tiramisu cake & the best birthday cake! deb: could i replace the raisins in this apple bread pudding recipe with dried cranberries…& would i plump them up the same way as the raisins? This recipe looks good, but I can see where it might be difficult to fold in the egg whites. Maybe if they were beaten only to soft peaks? It seems like it would be easier if part of the bread were mixed in with the yolks first. Who knows, your way sounds like it works, so be it. You tweeted about hearing a baby cry at inconvenient times. I remember that feeling too. I always, ALWAYS, heard it when I got in the shower. It got to the point that I showered before Rick left for work..just so I could have some peace of mind and a continuous flow of hot water without shutting it down to listen! Gads..that maternal ear is so tuned in that it can make you begin to think you’re going crazy! Hmmmm maybe there is something to this “bread pudding” after all. Just made a pumpkin bread pudding yesterday ~ Love these FLAVORS of Fall!! This is a recipe that I almost always have all the ingredients for. So inorder to fight the cold weather and a desprate attempt to warm up from inside out, I can’t wait to try this recipe! Recipe looks great! Just wondering if the molasses is necessary, can I substitute it for honey or maple syrup? YUM. I’m putting this on my “to do” list!! But umm…where’s a picture of Jacob?! I’m sorry, that baby would STILL be cute in form-fitting Spandex. But he is cute in the hat. Have you seen the tiny blue jeans and the tiny, tiny workboots? I’m going to try individual versions of these with half wholewheat bread…yum! OH MY GOD. You sent me right back to the first few months of motherhood with this post. I remember trying in vain to explain the madness of nursing to my childless friends–I can’t cough/sneeze/itch/drink/eat when I want to! FEEL FOR ME, PEOPLE–and getting nothing but blank stares. I will continue to rely on you for such reminders as a form of birth control. However, once that head control kicks in, you’ll be doing the one-arm-nursing-other-arm-sauteeing with the best of them. I love all these comfort foods you’ve been turning out lately. Awesome! Wow, I just found out I like bread pudding this year and this looks great! That’s totally getting made this weekend! I’ll probably sub dried cranberries for the raisins, though. I don’t like raisins, but I *love* cranberries with apples! oh my – that picture of him in that hat! Too cute for words! awe. love your blog. looks delicious. I just got into your blog recently… I have lots to catch up on! Your gorgeous, thoughtful recipes will keep me busy through the holidays and beyond. Although I have to admit, the real reason I was inspired to comment was to tell you how absolutely beautiful your baby is! Congratulations! I am not even sure I like bread pudding. But I will make it because you liked it and your wrote about it. It’s so easy to convince me when the story is good! What?? You didn’t bake the bread yourself?? Thanks for sharing. I feel the same with my Julia. She is 7 weeks old… still just like you I carved some time to cook the simplest apple tart, yum and my husband favorite the pear and chocolate cake. Bread pudding is one of those decadant winter-specific desserts. It’s just too sticky and dense for the heat of summer but in the cold? Oh yes. It also happens to be my boyfriend’s favourite dessert. Haha, I’m guessing I’m going to have to tweak it a fair bit to make it dairy free and gluten-free, but I’ll try! Hope you’re doing well, mama! mmm perfectly autumny and wonderful sounding! I was itching to cook days after baby girl was born. I’d find myself flipping through cookbooks and magazines during our nursing sessions and dreaming about the meals and treats I’d cook when I had a free moment. You might try slowly adding the custard to the whipped egg whites instead of the other way around. It’s usually easier to add thin to thick than thick to thin. I love bread pudding! Sooo much. Yummy, yummy, yummy. This sounds good – would it be irreparably damaged if the almonds were omitted? Dan — Congratulations! She’s so freakin’ cute. You won’t miss the almonds; it’s more about texture than flavor. fabulous! 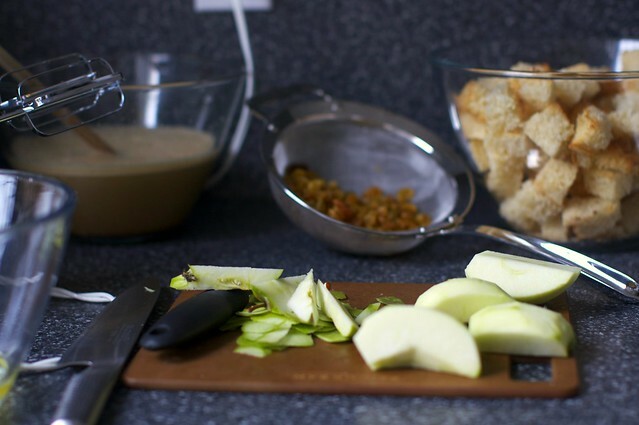 i have apples on my counter waiting to be made into a bread pudding! I was never as thirsty as when I would sit to nurse. You quickly figure out to have a sort of mise en place of necessities around you. Otherwise, I always felt completely stuck. Thanks! And thanks – one of my few food quirks is that I’m not overly fond of nuts in my recipes (except salads) and I usually leave them out when possible. I’m new to your site and just wanted to thank you!! I made the squash tart a week or two ago and my boyfriend said that it was heavenly! I also made the cauliflower roasted with the capers, raisins, almonds and herbs on top last night – fantastic!! I don’t think that I’d had cauliflower since I was a kid and wanted to try to trick myself back into it. Great job. Your photos are incredible and I’ve been making lists of what to delve into next. Tonight I have some brussel sprouts to attend to, but I’ll be back tomorrow looking up some ways to work off my CSA veg that I’m picking up tonight. I also love your very comprehensive listing of other food/recipe/life blogs and sources. I don’t know how I’ve gone so long with stumbling upon these; guess I’m breaking out of cookbook/magazine/NYTimes and epicurious searches now!! oh, why oh why did I come here on Day 2 of Atkins?! I do believe I will be making this next week! I went on a cooking spree yesterday and almost every single recipe was from Smitten. No knead bread? check. Cheese straws? check. Peanut butter crispy squares that melt entirely too fast? check. Today I finally branched out and remembered that oh yeah I can cook without a recipe. But then you show me this bread pudding and now its back to my kitchen being a smitten kitchen. Hi Deb. This is an amazing website; I’ve loved all the recipes I’ve tried so far. The pickled carrots were a particular hit at my last party. Question about this bread pudding: I love challah bread, especially the crust. Do you think it would it work ok to leave at least some of the crust on? How about a fruitcake recipe for the upcoming holiday season. I can’t believe you didn’t plump the raisins in hot brandy, or at least add a splash to the custard. Are you feeling okay, Deb? Rebecca — I know, I am so off my game. All of the booze I crave just puts me to sleep these days… sigh. mmm, apple desserts are my fave these days!!! I cannot believe that I haven’t found you sooner…. very cool site- indeed! This look delicious! I can’t wait to give it a go. Great website and beautiful photographs. I think (could it be?!) that you’re getting funnier as a mother. This looks delicious, as always. You always have me drooling over your beautifully photographed and beautifully written posts. I’m bookmarking this! Now, I can’t guarantee that it won’t get lost in my several million (maybe I’m exaggerating just a bit, but it sure feels like a million!) recipe bookmarks, but I can guarantee that it will be made sooner or later because it looks simply delicious! As a side note: Where the did you get that set of awesome plates from (like the one shown in the last photo)? Our plates are Calvin Klein Khaki/Cargo (?). Wedding presents straight from our registry! They’re sage green; I would totally get white if we could do it over again. Oh, Deb, I can relate about the Itch. Your recipe looks great — sweet and hearty. My mom actually made us bread pudding when I was newly mommed and it was so comforting. She did not use molasses, which I think would step it up a comfort notch. I’ll pass it on for the next child…. Comfort food at its best!!! Oh Deb, this sounds familiar. Then, 6 years later, I have a kid who doens’t like to eat all that good food! And his little sister is entering a picky eating phase herslef, I fear. Arrgh. Kids. I’ll just have to cook all the good stuff for me and the husb. Let them choke on cheese and carbs as much as they want. I’m not typically one for bread pudding (although your’s sounds good and might tempt me to try it one more time), but your description of feeding an infant had me in flash backs. So many hours of feedings! Soon though you will be able to itch and drink and feed…it is amazing how versatile we can become. I can remember breast-feeding my first while loading the dishwasher, changing over laundry, and even fielding work phone calls. Enjoy your quiet moments with your babe–mine are already 6 & 8 and I remember people telling me that too when they were little, but really, really do. Oh. this looks awesome. I just made Challah bread and was thinking about making some breadpudding. oh, the need for something the minute you start nursing! i used to wish for the powers of a jedi all the time…. use the force, luke! you have a terribly lovely site that makes, even me, want to cook! blessings to you! Just wanted to say, I love you Deb! You make my day! I’ve been wanting a good bread pudding recipe for AGES! I think I’ve got a little drool at the corner of my mouth…Yummm.. I have never, ever had bread pudding before. This *does* look interesting — and very cold weather comforting! Seriously, I can almost smell this. The photos are beautiful. LOVE golden raisins and apples together. Bookmark. Now. No baby for me yet – but we are still on the same wavelength. I woke up Sunday and just couldn’t abide the thought of going to bed and not having made Bread Pudding. That. Very. Same. Day! I must admit, I did a “trashy” version and used sweetened condensed milk. But I did have a very good crusty farmhouse french loaf for the bread cubes….! Oh, man…that looks so delicious!! I’m a sucker for bread pudding. lovely, but where’s the baby picture? Looks so good. Wish a certain someone-who shall remain nameless, but has loved me for 37 years-would enjoy it with me. Blessings on your feeding, nap, and all other times! They won’t last forever, soon you’ll be in a new season of life. I had to laugh about the Itch – oh, I remember those days. And the water glass being just beyond the reach of my finger tips. Of course, as I (and son) got better at it, I remember reading Watership Down during long hours of feeding. 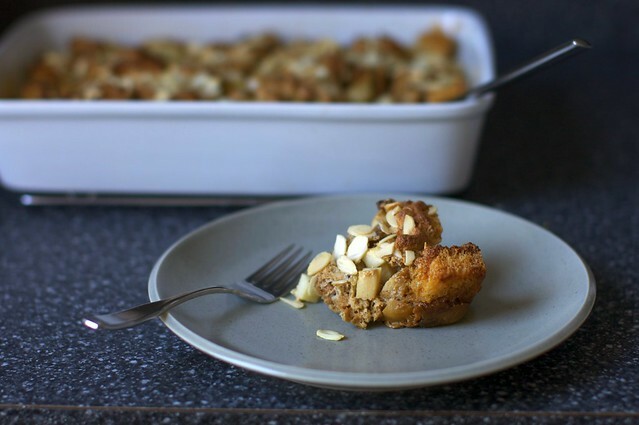 Thanks for a new bread pudding recipe – I love bread pudding. 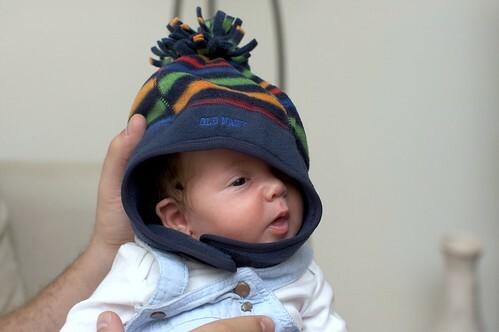 Oh – and the Jacob pics are just too cute! You read my mind! :) Thanks, Deb! I love your blog, recipes, photos and especially your blurbs about your baby Jacob! This recipe is in the oven! My friend just introduced me to your blog and today I am trying this one as well as the salted brown butter rice krispy treats… yum. That looks amazing and very much worth the wait. I’m sure your baby will appreciate having such a fantastic cook/baker for a Mama! I had a loaf of brown butter bread that was a wee bit stale and ended up being thrown in here. Needless to say the butter count was high and the deliious factor was way up! I recently bought a loaf of whole grain bread that was past its prime and made it into Butterscotch Bread Pudding. I love bread pudding. It is so homey and comforting! It is also fun to play with, adding this and that. The pictures of your dishes are as amazing as the recipes themselves! You have a fantastic blog. OK, so I’m now reading this site as much for the Smitten kitchen baby pictures as for the Smitten kitchen recipes. Is this wrong? Sooo remember the thirst thing, to the point where I now go up to complete strangers feeding their babies in cafes and hand them glasses of water. How to get extremely grateful smiles from people you don’t know! Oh and the pudding looks good too, will give it a go. What does “half-inch pieces” mean exactly, with the apples? I’m trying to go by your photo and I think you mean slices which are half an inch thick at the thickest, but that seems like very few chunks of apple distributed throughout this whole thing… could you clarify? Thank you! I think I may fall over. I am SO hungry today and this did not help. I’m going to have to make a list so I don’t forget anything when I go to the store. Is it bad that I scan your blog for pictures of Jacob FIRST and then read the recipe??!! My daughter is 3 and while I love that she is my little shadow and walks and talks and is potty trained, I do miss those first few months of her being such a sweet little nugget totally and one million percent dependent on me! I think this recipe might be on the breakfast table Thanksgiving morning! Thank you, Deb! I was having thoughts of bread pudding with apples, but wasn’t sure what the extra moisture would do to my usual recipe if I just hacked up an apple and tossed it in. Problem solved! And, as possibly the world’s laziest cook, I have to ask – does toasting the bread make a difference in flavor or texture, or can I just follow my usual routine and let some go stale before I “pudding” it? I just took this out of the oven. You constantly push me to try recipes and techniques I wouldn’t otherwise and to challenge myself. It came out beautifully and I can’t wait for my boyfriend to get home and see what I made him. Thanks so much for all of your guidance and recipes! I also just pulled this out of the oven, and…wow. This is my new go-to bread pudding recipe, Deb. LOVED the raisin and apple additions. To answer your questions, Jess, I cut my apple pieces up so that they were ROUGHLY half inch in every direction. Tiny little chunks, basically, I found it really didn’t need to be perfect, AND you got delicious apple bites in every spoonful. Someone just asked me for a substitute for crystalized ginger in my Apple Ginger Crumb Bars. I was at a loss, but after reading this, I thought, hmm, maybe throw in some raisins. I will be so sad when apple season is over here, but I’m always happy when the next season comes along! This is a very unique recipe!!! I do like the rustic look of it. I’ve been thinking about bread pudding lately :) This looks delicious. I have 3/4 lb. pork sausage in my fridge and I had no idea what to do with it. I searched your blog, and now I can’t decide between the sausage stuffed potatoes or the tomato-sausage risotto! Thanks for giving me such delicious ideas! I can’t wait to cook tonight! Aha! A new reason to bring home extra bread from working in the bakery! I knew there was something other than french toast…. Well I was getting ready to huff and puff about Baby Boy being MIA on this post but found his sweet self on FLickr. Don’t even think about depriving us. Recipe sounds divine of course. Mine had lots of foamy on top too, and I didn’t separate the eggs. Oooh, I like bread pudding that’s not too gelatinous, I bet this would be perfect. I hear ya on feeding a baby, nursing or bottle-fed. It’s not as easy as it seems like it would be!! And, it can be incredibly frustrating. Especially at 3 in the morning. I had to start a stash of sweets right next to the spot I nurse my little guy, reserved just for feeding sessions, to make it into something to look forward to in the middle of the night instead of resenting my cute little alarm clock. I started to salivate when I saw this recipe. I’m a fan of bread pudding but find that it’s really hard to find a perfect consistency. I wanted to make this for Thanksgiving but realize that baking experiments don’t fare well with my large family so I tested it out today with my coworkers. It was a H-I-T! My grocery store was out of challah bread so I just used a loaf of french bread and decided to use the crust. I also substituted white sugar with brown. Yum yum in my tum tum. I am now officially ready to make this for my family on Thanksgiving. Thanks again for a great recipe! I’ll have to put this one on the short-list of nap time recipes to try. I’m a new mom, too – I can completely identify with the too-many-recipes-not-enough-time problem as well as the insane thirst during feedings. So glad to hear I’m not alone! mmm…I bet this would be amazing with a warm caramel sauce! Thanks for this recipe! I made a couple of changes to the recipe for personal preference (and because I had the stuff on-hand). I soaked the raisins in hot apple cider and used lowfat milk, and it came out beautifully! i must have the same tastebuds as u, love the website and all the recipe ideas….im gonna try this but with palm sugar, toasted coconut shavings on top with kaffir lime zest and see what happens, cheers! I made this recipe but subsituted almond milk for the milk and date honey for the unslufered mollases and it came out wonderful!! I keep kosher so making a parve bread pudding was risky but it came out great. Keep up the great work! Love your recipes! I made the bread pudding for a potluck brunch yesterday. It smelled divine while baking and felt like it weighed 10 pounds when I was putting it in the oven. Unfortunately, I wasn’t able to eat it while still warm. Changes I would make: I used the 4 egg/4 cup milk option. I would try 4 cups milk and 3 eggs for the next time. It was a little too eggy. I used challah bread, so that adds to the egginess. Also, I think I’d use 2% instead of the whole milk and see if it’s noticable. Otherwise, it was super-duper-wonderful! Thanks for posting such enticing recipes!! Where has this blog been my whole life??? I finally got around to making this on Friday, and it was fab-u-lous! I had to improvise a bit with the ingredients, though. I used two cups whipping cream and a cup of almond milk and omitted the ground ginger and molasses. It was excellent without the molasses, but I imagine it would’ve been even better if I had put it in. Next time! This recipe is fabulous! I used a rock-hard whole-wheat baguette, so didn’t remove the crust. It was absolutely DELICIOUS and looked great too. This is a perfect dessert dish for a potluck. Delicious! I used three day old challah, and 2% milk. I didn’t have fresh apples, so I substituted 1/2 bag of dried apples, snipped into chunks. Same with the raisins, but dark raisins worked just as well. I used toffee glazed almonds for the top. My husband’s demanded sauce, so I made a bourbon sauce, which perfectly complimented the molasses and spices of the pudding. Man-O-man-O-man! I made this bread pudding with 4 eggs and 4 cups milk and was glad to see the more pudding-y texture it come out with. Tasted very good. I used all freshly ground spices which made the pudding so so special. Every time I make this I am missing some ingredients. And, every time I make it, it comes out wonderful. I am forever making this at my boyfriend’s apartment, so we use the only spice he has to flavor it- a nub of ginger- and brown sugar instead of molasses. I finally brought over raisins, vanilla, and cinnamon (we’d been using cranberries before) and the result is baking right now. I’m just enjoying the leftovers of this delicious bread pudding I made yesteday. It’s really good even when it’s cold, with a lot of vanilla sauce! I used a leftover french baguette, blueberries instead of apples and then I found some Amarettini in the cupboard which I crushed and put into the mixture. Just perfect! That’s precisely how I became known for my almost flourless chocolate cake. It was a recipe I could make with two screaming kids hanging on my legs. No matter what I did to it, it still tasted great. I made this last night using wheat dinner rolls I’d made last week. I only had four left, so I doubled the apples and cut the milk by 1 cup to ensure it wouldn’t be soupy. I also must cop to adding bourbon to the custard mixture. When it was almost done, I made a half & half-based salt caramel sauce on the stove. I have never before heard my husband rave about a dessert like he raved about this. Thanks Deb! My husband asked for bread pudding for his birthday. Only substitution was bakery white bread for egg bread. He gave it an excellent rating and said it was a special birthday treat. Thank you for being my “go to” cooking website! This is delicious. I made this on New Years Eve and, thinking along the same lines as Rachel, served it with a bourbon sauce. Wonderful! I tried this one last night using a loaf of ciabatta. I liked it, but I think next time I’ll go a bit heavier on the spices and the custard. And maybe I’ll whip up a rum sauce to drizzle over it. I cannot imagine a future brunch without this delicious dish. Because this time it was for a 7 am weekday breakfast, I cut the sugar to 1/2 cup. Still plenty sweet for me. Subbed an extra apple for the raisins–used one firm and one soft. The Whole Foods challah took much longer to toast. I checked it very two or three minutes until the cubes crisped. I crushed some whole roasted almonds for the topping and upped the spices a bit. Cut the sugar to 1/2 cup, used your beautiful apple and honey challah, so no need for extra apple and added crispy bacon bits. And that apple and honey challah, well you are a genious. Hi Deb! I just made this recipe and oh my gosh…best November comfort food ever. Especially with a dab of creme fraiche or sour cream on top! I also wanted to tell you that if you haven’t already, you must! make a dish called Hungarian mushroom soup. It will coax you completely into the soup lovers guild (SLG). It incorporates: cream, mushrooms, dill, smoked paprika, white wine, a good chicken stock (!) and lemon juice. It is perfect by itself, or thickened slightly, over egg noodles. I haven’t seen it in your archives and thought that I needed to tell you about it, since it incorporates so many of your favorite cooking themes. Please give it a whirl and let us know what you think! YUM! This looks amazing and will no doubt be part of my Christmas brunch. Question: Can this be soaked overnight and if so, how does it hold up? Just made this and it was excellent! Used up a range of left-over bread, so instead of challah was a mix of chocolate hot cross buns, traditional hot cross buns and soft multi-grain sandwich bread. I also bumped up the spices, and used less sugar to compensate for the sweet bread. The only problem is trying to muster up enough self control to not eat the leftovers by myself! Thanks again Deb for a fantastic recipe. Can this recipe be made/prepped ahead, like the Salted Caramel Morning Bread Pudding? I’m hosting a brunch this Saturday, and would really like to have it ready to go in the oven when I wake up!